SLS, or selective laser sintering, is a 3D printing technology ideal for rapid prototyping and low-volume manufacturing applications. The outstanding precision possible make it the 3D print technology of choice for printing parts with living hinges, moving pieces, snap fits and additional applications where tight tolerances are required. SLS is often used for Direct Digital Manufacturing (DDM), a type of additive manufacturing like FDM/FFF and SLS 3D printing. 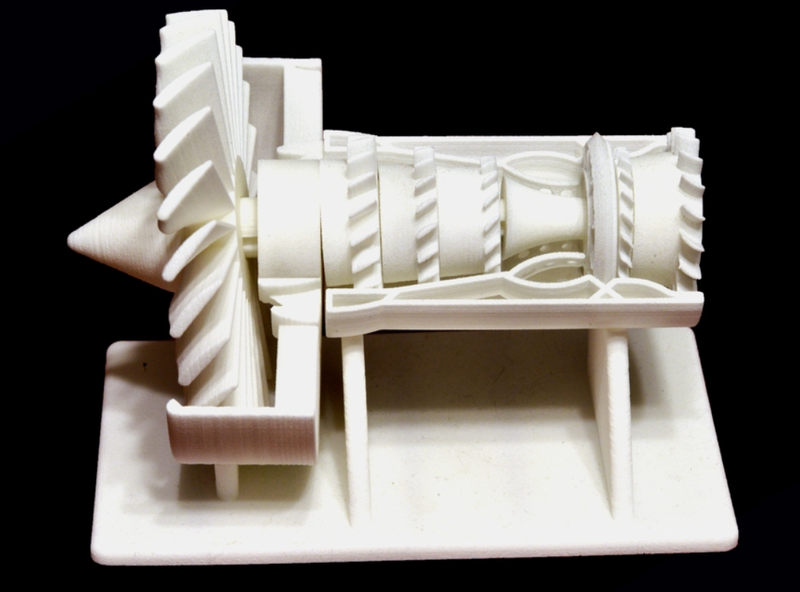 Selective laser sintering got its start at the University of Texas in the mid-1980s when Drs. Carl Deckard and Joe Bearman developed and patented the technology. The two were later involved in the startup of DTM, an early manufacturer of SLS 3D printing machines, which was acquired by competitor 3D Systems in 2001. 3D Systems is now the leading manufacturer of SLS printing machines. Let's take a closer look at the technology used in SLS printing, working from this diagram. 3D design and slicing: CAD or CAM software is used to create a three-dimensional design of the prototype, part or object. The first step is to use additional software to slice the file into layers that will be sent to the printer and printed consecutively to build, that is, print the object. SLS build platform/powder bed: A build platform, often called a scan bed or powder bed, functions as a base for the printed object. It is controlled by a piston that lowers it the thickness of one layer of printed material as each is produced. SLS powder storage: While FDM/FFF prints with layers of molten material and SLA uses a laser directed onto liquefied polymer resin before curing it with UV light to form the layers, SLS prints onto a bed of powder using a laser that sinters it (see "Sintering laser" below) to form the layers. The powder bed is also controlled by a piston that moves up the thickness of one layer as each is printed. Sintering lasers and powders: To sinter something originally meant to weld or fuse it without melting anything. Heat is used, however, in SLS printing in non-melting, partial-melting and full-melting applications depending on the material used. The lasers are high-powered CO2 lasers. The powders used in SLS printing technology are heat fusible. They are often metallic, but other materials are employed as well (see below). The laser systems in various SLS 3D machines may be housed separately and directed through a scanner onto the build platform (as shown) or may be part of a complete image projection module. In either case, the laser is guided by the CAD/CAM and slicing software to trace the next layer onto the top layer of powder particles in the scan bed. Only the particles producing the next layer of the part is fused; the remaining powder serves as support for the build part and can be recouped for later use. Roller assembly: After the sintering of each layer, a roller passes over the powder bed as it is raised to gather powder to push into the cylinder containing the build platform for the sintering of the next layer. The roller compacts the powder, a process which allows for more precise sintering. Single and multiple parts: The 3D design can be of a single part or of multiple parts on a parts tree that can be separated after production. 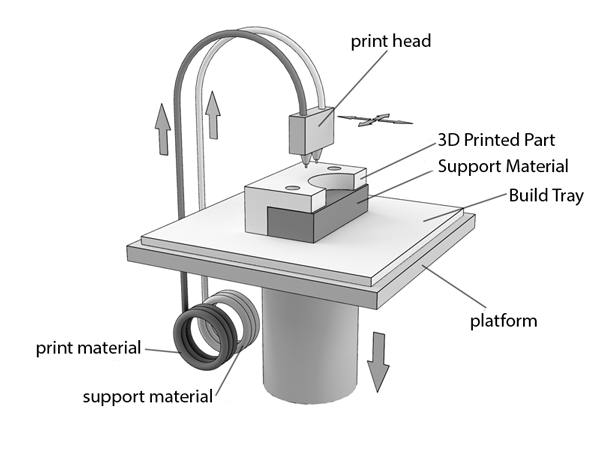 Brushing and cleaning the part: When printing is complete, the part is removed from the build platform. Un-sintered powder is brushed from it, and the part is bead-blasted or pressure-washed. Metal: Aluminum, steel, titanium and a variety of alloy particles are used to create objects with the proper strength properties. Polymers: Nylon and polystyrene are two polymers popularly used in SLS. The material can be glass-filled or be impact resistant, depending on the exact formulation of the material. Glass: This material is used in design, art and by hobbyists. Rubber-like materials: These flexible materials are typically proprietary, such as Duraform Flex plastic from 3D Systems. Green sand: A mix of silica sand, chromite sand, bentonite/clay, water, anthracite and inert sludge is known as green clay. The name refers to the fact that it is used to make molds for castings while the material is still "wet" and therefore "green" as opposed to dry/cured. Like FDM and SLA printing, SLS has its advantages and disadvantages. Here are selective laser sintering pros and cons for you to compare with lists found in our guides to FDM and SLA. Here are the reasons for the popularity of this technology. Speed: For skilled CAD/CAM users experienced in SLS printing, there is a short lead time from concept to design to prototype. Diversity of materials: As noted, you've got outstanding choices for the prototypes, parts, tools and toys you want to make. Parts with excellent functionality: Tight tolerances and precision make SLS a great choice when performance must be high. Durability: Tough materials can be used to create durable, wear-resistant, chemical-resistant and/or heat-resistant parts. Movability: Parts with functioning hinges, joints and fits are easily made. Precision and difficulty: Parts with challenging geometries and design not possible with other 3D printing types can be rapidly produced. 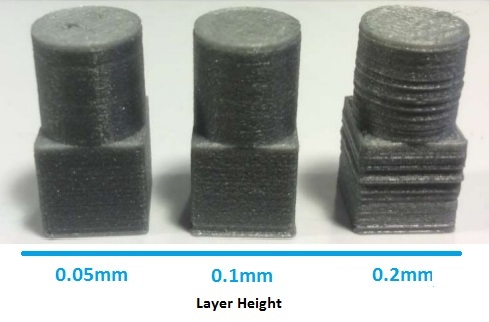 Free of support structures: Both FDM and SLA technology require that support structures be printed along with the part, but in SLS manufacturing, the un-sintered powder acts to support the structure being built. Affordability: For a low-volume of end-use parts, SLS is an affordable alternative to traditional manufacturing. Keep a few potential disadvantages in mind as you consider SLS for your project. This flexible 3D printing technology has many applications. Rapid prototyping: Functional models used to prove the concept are created with SLS for design evaluation, testing of performance and design verification. Rapid manufacturing: Customized and rapid manufacturing using SLS is ideal for aerospace, unmanned aerial systems and vehicles, medical and dental, connectors and other electronics and military hardware. Custom tooling: SLS printing is used for concept development, rapid tooling, injection mold inserts, jigs, fixtures and sand-casting patterns. SLS vs FDM: FDM printing, or Fused deposition printing, is also called fused filament fabrication, or FFF. 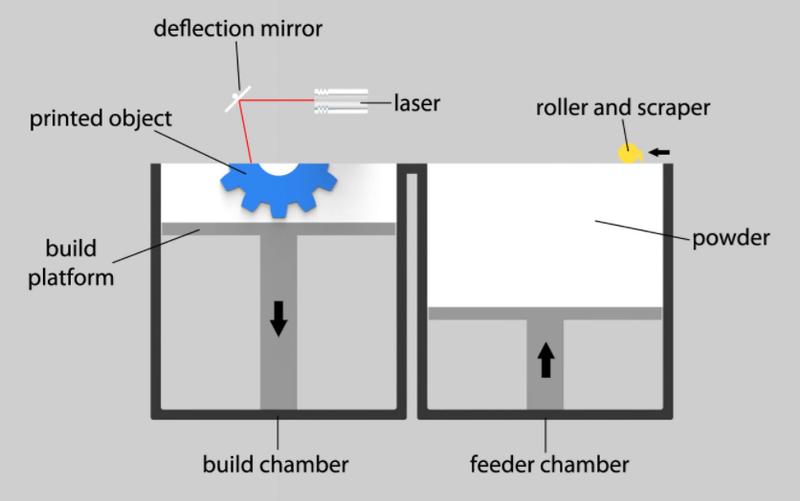 This is a diagram of an FDM printer. The material used in FDM additive manufacturing is solid rather than powder. It is heated as it passes through a printer head, and the molten material is deposited layer upon layer to form the piece. No lasers are used as in SLS. While FDM is cheaper, the layering is also more obvious. FDM requires the printing of support structures; none are needed for SLS because the un-sintered powder in the build bed support the piece as it is built. SLS vs SLA: SLA printing, or Stereolithography, is a 3D printing technology like SLS in that both processes use lasers. In SLS, the CO2 lasers fuse powdered particles of metal, plastic, ceramic composites and other materials to build objects on a platform. 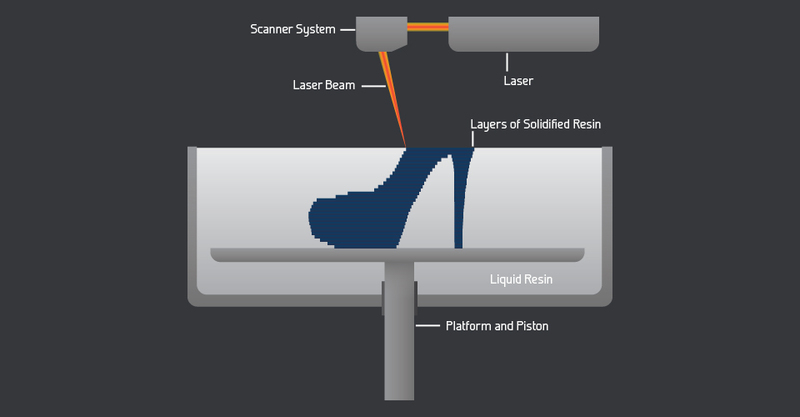 The UV light lasers employed in SLA printing are directed at a vat of liquefied polymer, as shown in the diagram where a shoe is emerging from the build platform immersed in the vat. The laser above is curing the liquid into solid one layer at a time. SLS vs PolyJet: PolyJet 3D printing is a proprietary type of liquefied polymer printing. 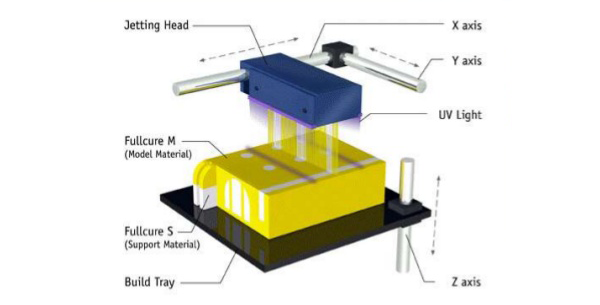 However, instead of being stored in a vat as in SLA, the polymer is stored in a print head and cured by UV light as the material is deposited. Similarities between these technologies include a stationary build platform with an overhead component that moves on X and Y axes. PolyJet printing requires the printing of support structures; SLS does not. When designing for an SLS print project, these tips will help you achieve success. 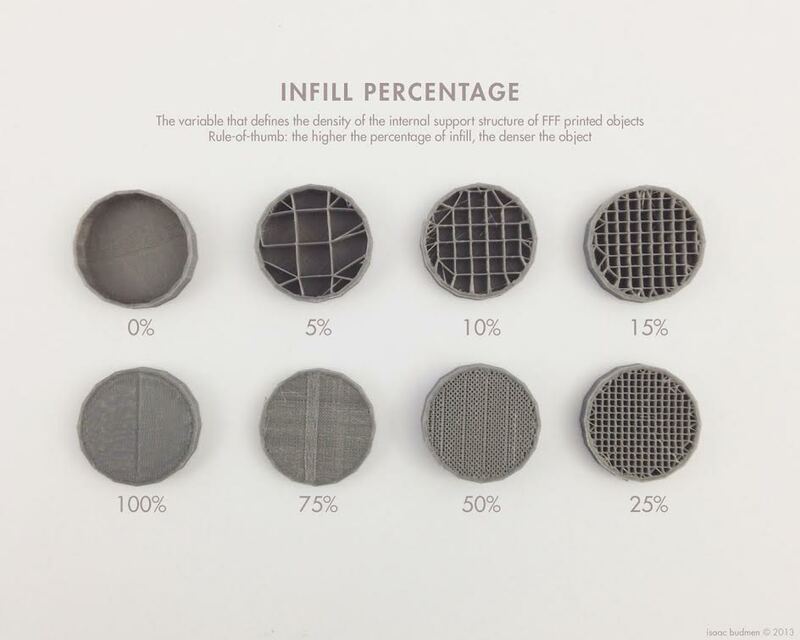 Because of its many uses, selective layer sintering demand is expected to continue to be strong in the foreseeable future. Another factor making it the go-to choice for many prototyping and low-volume manufacturing is the availability of glass-filled and aluminum-filled materials that improve performance and machinability, are smoother and look better too.